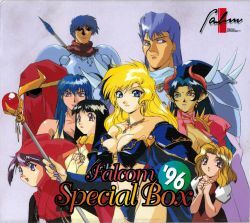 Falcom Special Box '96 is a compilation of music and drama from various Falcom games spread across three special volumes. This is the eigth produced 'Falcom Special Box' volume. Disc 1: CD Drama "Ys V - Kefin, Lost Kindom of Sand"
Disc 2: CD Drama "Brandish Gaiden"